Equipped with the renowned ESS Sabre32™ DAC technology, the 624 delivers the same superb analogue audio quality and proven, award-winning performance as MOTU's flagship 1248 audio interface, giving you everything you need to turn your computer into a powerful 24-bit/192 kHz digital audio workstation. The 624 connects to any computer or iPad™ with Thunderbolt™, super-speed USB 3.0, AVB Ethernet or USB class-compliant firmware. New optimized MOTU drivers work with all your favourite audio apps, delivering industry-leading, ultra-low round-trip latency (RTL) performance as low as 1.6 ms at 96 kHz over Thunderbolt with high-performance DAW hosts. 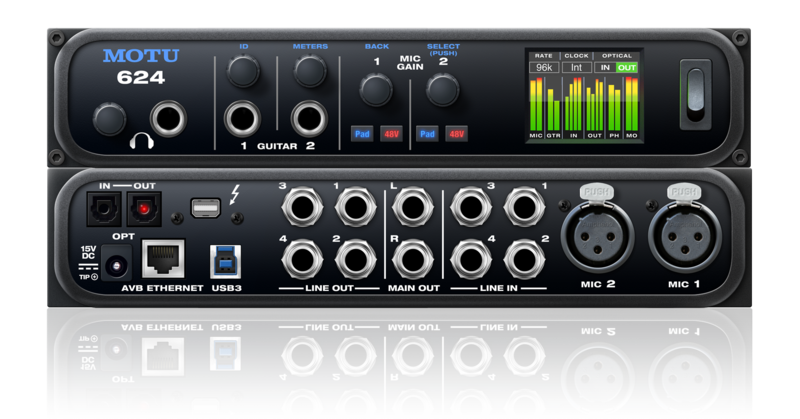 Housed in a rugged, compact enclosure you can take anywhere, the 624 provides eight channels of pristine analogue I/O, including two XLR mic inputs with individual preamps, two dedicated front-panel hi-Z guitar pickups, dedicated main outs and a front panel headphone jack, combined with eight channels of ADAT optical digital I/O, for a total of 32 simultaneous audio channels. Connect all of your studio gear, including microphones, guitars, synths, keyboards, drum machines and effects processors. Record, monitor, route and process all of these live inputs with no latency and no processor strain on your computer. Extensive routing features let you patch ins to outs, or split inputs to multiple destinations. Powerful DSP delivers large console style mixing with 48 channels, 12 stereo busses, and 32-bit floating point effects processing. Add Classic Reverb™ with lengths up to 60 seconds. Further sculpt your sound with 4-band parametric EQ carefully modelled after British analogue console EQs. Choose between two forms of compression: a conventional compressor and the Leveler™, an accurate model of the legendary LA-2A™ optical compressor that provides vintage, musical automatic gain control. 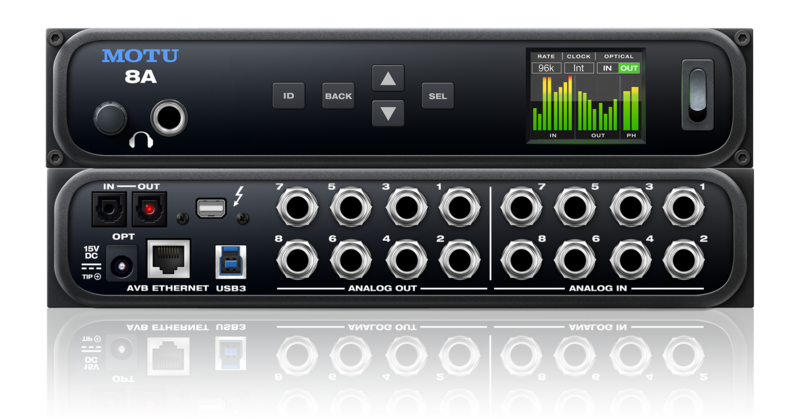 After recording and mixing in the studio, unplug the 624 from the computer and take it on stage for operation as a stand-alone mixer with effects. Control everything over Wi-Fi from your favourite web browser running on your laptop, tablet and smartphone. 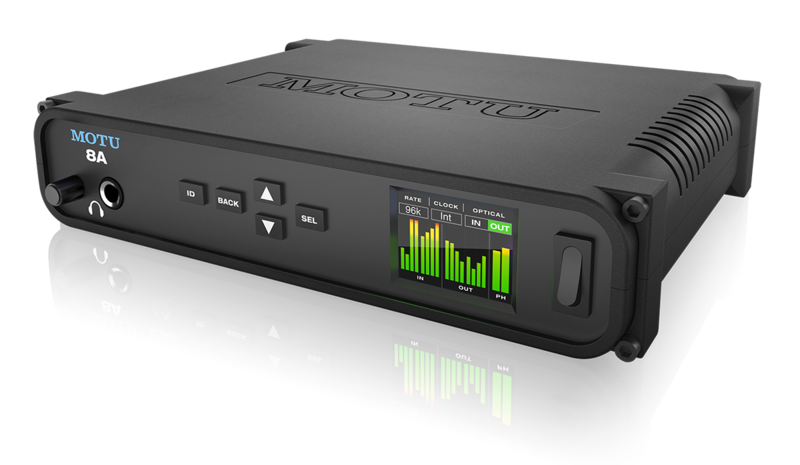 Through AVB/TSN Ethernet, connect another MOTU AVB interface for more I/O — or connect to an expanded MOTU AVB network with multiple interfaces and computers. Equipped with the renowned ESS Sabre32™ DAC technology, the 8A delivers the same superb analogue audio quality and proven, award-winning performance as MOTU's flagship 16A audio interface, giving you everything you need to turn your computer into a powerful 24-bit/192 kHz digital audio workstation. The 8A connects to any computer or iPad™ with Thunderbolt™, super-speed USB 3.0, AVB Ethernet or USB class-compliant firmware. New optimized MOTU drivers work with all your favourite audio apps, delivering industry-leading, ultra-low round-trip latency (RTL) performance as low as 1.6 ms at 96 kHz over Thunderbolt with high-performance DAW hosts. 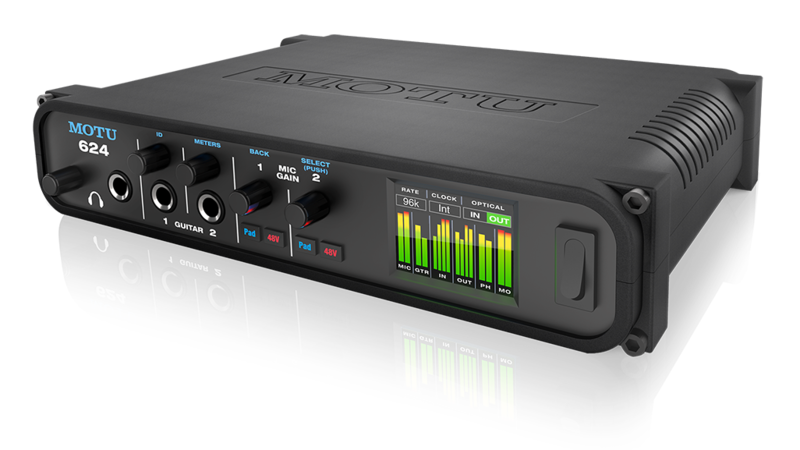 Housed in a rugged, compact enclosure you can take anywhere, the 8A provides eight channels of pristine analogue I/O and a front panel headphone jack, combined with eight channels of ADAT optical digital I/O, for a total of 34 simultaneous audio channels. Connect all of your studio gear, including synths, keyboards, drum machines and effects processors. Record, monitor, route and process all of these live inputs with no latency and no processor strain on your computer. Extensive routing features let you patch ins to outs, or split inputs to multiple destinations. Powerful DSP delivers large console style mixing with 48 channels, 12 stereo busses, and 32-bit floating point effects processing. Add Classic Reverb™ with lengths up to 60 seconds. Further sculpt your sound with 4-band parametric EQ carefully modelled after British analogue console EQs. Choose between two forms of compression: a conventional compressor and the Leveler™, an accurate model of the legendary LA-2A™ optical compressor that provides vintage, musical automatic gain control. After recording and mixing in the studio, unplug the 8A from the computer and take it on stage for operation as a stand-alone mixer with effects. Control everything over Wi-Fi from your favourite web browser running on your laptop, tablet and smartphone. From studio to stage, the 624 and the 8A deliver exceptional sound quality, state-of-the-art operation and rock-solid performance.